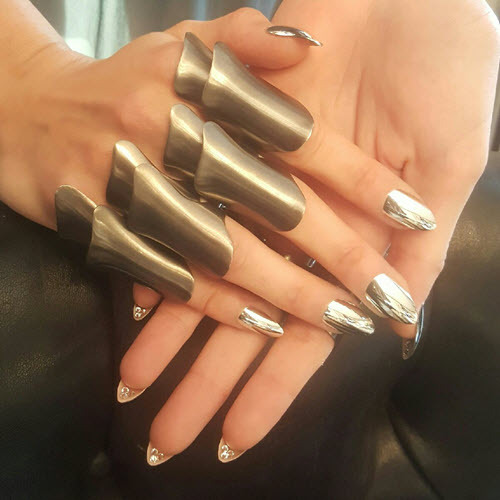 Chrome nails are the hottest trend to hit 2017. Are you ready for them? In 2016, we thought bracelet nail art was going to be the IT thing for the new year. 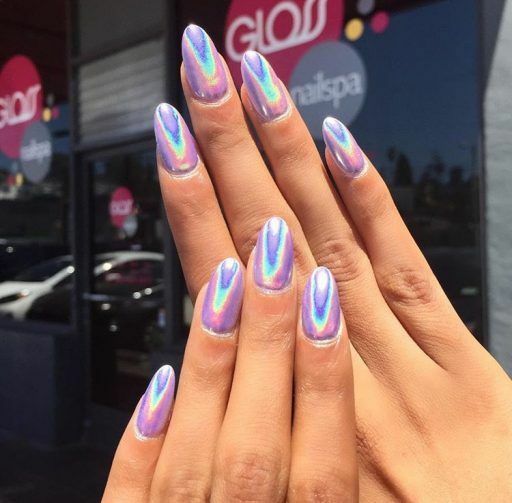 Sure, the nail art world went crazy for “holo” or holographic nail art but we sure didn’t see the next nail art trend coming — chrome nails. Chrome nails and holographic nails are being used interchangably nowadays. Both are metallic but while holographic nails give off a irridescent rainbow effect, chrome is strictly mirrorized and reflectorized. And boy, how they go like a kaleidescope when you move your hands in the light! You know you’re looking at holographic nails when the shine has all colors of the rainbow. It’s just like that sheen on an oil puddle — only prettier, of course! Now let’s check out chrome nails. Beautiful and schmexy, right? They should be! You’re looking at Gigi Hadid’s $2,000 dollar nails. 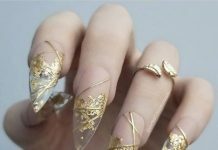 As if her perfect looks, dress, and beau Zayn Malik weren’t enough, Gigi Hadid came to the Met Gala Debut with these crhome nails that soon came to be the talk of the town. Her nail artist, Mar y Soul, added 3 precious cyrstals underneath each nail and used an amazing chrome nail polish. 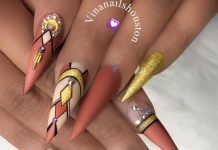 Unfortunately with this nail trend, the more dough you spend, the better quality you get. You get better application, more staying power, and better color impact all around. Unless you’re a Gigi Hadid with sponsored nails, we’re all working on a budget. Here’s how you can do chrome nails diy. Make sure you have clean nails. Buff them so they are nice and smooth. Next, do one thin coat of gel black nail polish. Cure for 60 seconds with a LED lamp. Add another thin layer of black nail polish for each nail. Cure again. Buff the nail lightly so that you get a smooth finish. Clean nails lightly with isopropyl alcohol to clean up. Next, apply one really thin UV topcoat. You need a non-sticky topcoat for the metallic polish (no wipe top coat). Cure for 90 seconds or whatever the instructions on your top coat says. Apply the chrome powder using an applicator. Put some pressure while applying the powder. At the same time, buff your nail. 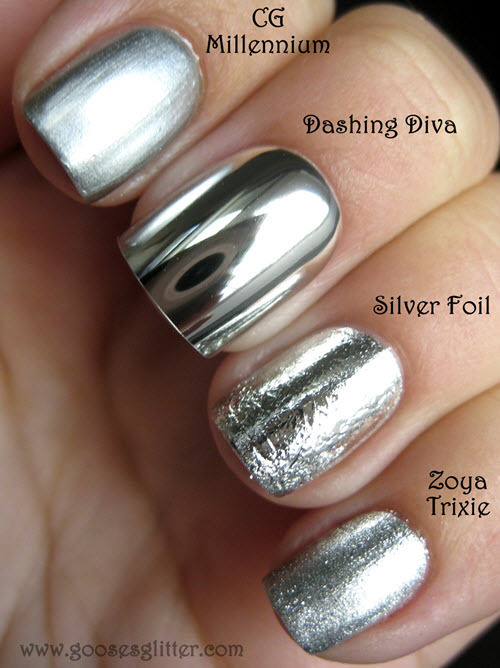 This will remove the sparkle and create the metallic shine of a chrome nail. The more you buff, the more chrome-y your nail will look. Apply two coats to create a better effect. Once you’re done with all your nails, dust off excess powder with a brush. It’s important to clean around your nails and finger tips. Apply another thin layer of UV top coat and cure for 90 seconds. If you enjoyed our first video, you’ll enjoy this next video as well. We won’t list the instructions anymore as the principles are the same. Wipe off any excess chrome powder in your cuticles or side walls before top-coating. Otherwise, it will stick to your nail during curing and make your nails sparkly. This will nullify the clear mirror effect you are going for. Now if you’re a beginner to nail art or simply don’t have the budget for a LED lamp or chrome powder, what you need are chrome nail hacks. Check out this video by Janelle. Our favorite hack has to be the fake nails. You can buy them and the adhesive pretty cheap but just be warned that they won’t last long. They’ll be good for one night out and that’s about it. Which technique are you going with? 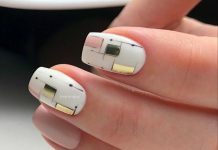 Good luck with your chrome nails diy style!